They were "object" and not "function" types. This is because they were themselves DOM objects retrieved by property getter lookup when queried by name. They had a strange create method on them. This was for languages which didn't support the new operator through the DISPATCH_CONSTRUCT functionality of IDispatchEx::InvokeEx. So that was pretty much the world in IE 5 and 7 modes. When we introduced 8 we introduced MDP or Mutable DOM Prototypes (more information in Part 1 of this blog series) and this introduced a slightly more advanced implementation of constructors. First and foremost we added names for all of the constructor types for at least the leaf types. This resulted in a little over 100 new constructor objects being added to the window namespace. Still, interrogating an IE 8 type system would be very foreign since the hierarchy represented OUR C++ hierarchy in the code more than it represented anything in a W3C spec. It was a solid attempt to provide value to web developers though and it was pretty cool to interact with the beginnings of a type system. They were still "object" types, which means you still couldn't see them as functions. You also couldn't use call/apply on them. This may not strike you as odd, but in the same technology we added "native methods" which did support call and apply so it was odd that a constructor did not receive the love. All of the new methods added the "create" method which mapped to DISPID_VALUE behind the scenes. However, since this was still COM based, it meant that property gets would return the name of the constructor "[object Element]" for instance, and invokes would try the objects factory if one existed. The prototype properties pointed at an actual object this time around, but the constructor pointed back at a DIFFERENT object than the constructor instance on window. This meant that Element.prototype.constructor !== Element... But Element.prototype.constructor === Element.prototype.constructor. We didn't yet support new features like the "name" property on the constructors. In FastDOM we had a choice of being a "function" or an "object" when making our constructors. The trade-off was memory. A "function" required that we fully initialize the instance with its prototype and any constant. An "object" we could defer this processing until first access. For this reason, we chose only to make objects which had a non-empty constructor function of type "function" and the rest "object". We in some cases still had "create" functions for legacy purposes. But they were implemented as static methods, a feature of WebIDL. We tolerated the use of call/apply on some constructors which seemed correct at the time. We still have such a tolerance while other browsers throw. A constructor object is generally a field on the Global instance. It should be a proper-cased. It should be derived from the Function prototype and therefore be of type "function" when queried with the typeof operator. These requirements will mean that it implicitly gets call/apply/bind from Function. It will also get properties for "name" and "length". The name property should reflect the name of the field on the global window.Node.name === "Node", though type system modifications could break this semantic easily. The "length" property should report the number of required arguments. For constructors this should normally be 0 as traditionally all arguments have been optional. Also important is to understand what the WebIDL might look like for such an interface. Its very simple, and we'll build on this to add more features shortly. Basically, the interface keyword specifies that we are building a concrete prototype object. The name in our case is ANode. This construct by itself tells us to build a constructor object, a prototype object with a default super (Object is the default super class), point the constructor and prototype at one another, and finally define a constant and a method. Also, since we specified static for the create method, it goes on the constructor instead of the prototype object. Normally, we'd put any attributes or methods directly on the prototype, but not in this case. There is one additional piece of information that I've left out, but is important. When you define constants, they must be written to both the constructor and the prototype. Our example ANode does not do this so it is technically incomplete, but I've left that out for brevity. There are two keywords in WebIDL that allow for a constructor function to be specified by a type. The first is the Constructor keyword and the second is the NamedConstructor keyword. The first says, use my current interface name, while the second says, use my specified name. We'll build one of each in the next WebIDL snippet. 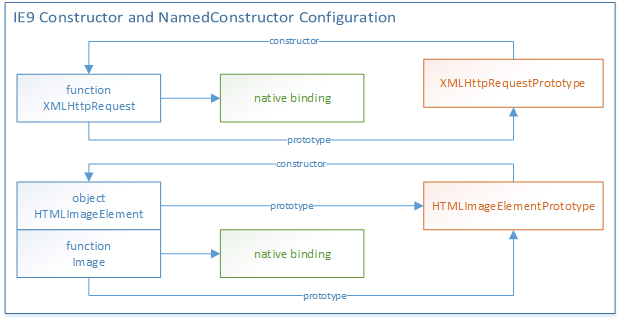 Namely the Image constructor and XMLHttpRequest. These annotations simply mean, that we should expect a constructor function to be available for these types. This is how the IE 9 type system would pick between a constructor being an "object" or "function" type. If you didn't have a constructor, then we could get away with you being an "object" type instead and thus get some memory efficiency by deferring construction. This is demonstrated by Figure 1. Notice how the NamedConstructor resulted in an object and an function that both point to the same prototype. Both constructors represent different ways of referring to objects of that type. The HTMLImageElement is the primary interface and so it gets a complete prototype -> constructor round-trip in the type system. The Image constructor is just an alias or name used in order to build instances of the HTMLImageElement type. The prototype also controls the final object. We don't build Image objects from the Image constructor, we instead return a new instance of the HTMLImageElement type instead. As of EdgeHTML the "object" constructor difference has been eliminated. In EdgeHTML the HTMLImageElement is also a function. However, it implicitly binds its [[Code]] property to a default constructor function which simply throws. All browsers have this functionality now, so if you tried to execute code such as, new HTMLImageElement(), you would get an exception. Turns out a generic object with a prototype property set up is still NOT an image element. Let's say for now that CImageElement, a C++ type in the backend, actually contains the code to be a full on image with rendering, ability to be put into a tree, etc... So we need one of those instead. The browser resolve this issue by simply using the constructor to determine the scope of the script engine. Image was a function created by some script engine, that script engine in turn was created by some browsing context, so we get to the browsing context and create an image of the appropriate type. Consequently this means if you screw up the type system, it doesn't matter. We'll still create the right type. For instance, if you null out Image.prototype, we can still create a proper image, because behind the scenes the browser has a complete and static view of the type mapping. You can still insert prototypes and do other tricks, but you can't fool the browser into creating the wrong type. At least not yet, we'll get to that in the "futures" section ;-). I'm going to wrap this up. Its already getting very long and I feel like event constructors could be covered in their own right. They are a huge feature and I would do them a disservice by trying to describe them in 3-4 paragraphs. So look forward to event constructors in a future installment and I apologize if this is the only reason you dropped by. You also got to see a rather cool feature called static. This was originally not in the WebIDL specification, but was inspired by IE's create methods. We needed a solution to implement legacy compatibility in IE 9 and thus were born static methods on constructors. Static can also be applied to properties (attributes in webIDL) but you'll be hard pressed to find a spec using such a complicated behavior today since usually constants are sufficient for this purpose. That is starting to get into Futures again, so lets just jump in! We've been evolving WebIDL and the capabilities of the type system, very, very rapidly. This leads to some interesting potential for future specifications to take advantage of, or even for improvements to existing specifications. Event constructors, was one such evolution. Once we described dictionaries as a way to describe the parameters of a function in a very loose, sparse way, we could then add a constructor which took such a dictionary and now events are super easy to create. It also beat the 27 parameter behemoth functions that were being created for initPointerEvent. It also allowed us, as browser developers, to begin adding new properties to existing events, without having to constantly evolve the init* methods to contain the new parameters. Basically this was becoming a mess, and constructors+dictionaries immediately rectified the mess. Okay, so we can namespace and module and scope and all of that. What else? How about element constructors? Right now everything goes through document.createElement and then once you get an instance back you have to operate on said instance. IE used to have a strange feature where you could createElement("
") and we would return an instance with some attributes set. That was actually kind of cool and in fact, when we removed that, we broke a lot of sites that relied on it. Imagine if we combined dictionaries with constructors like we did for events? This might allow for some neat scenarios such as creating an element with all of it attributes in one shot. I'm not saying it will happen or even that its a full baked good idea, but its worth thinking about. I hope you've enjoyed this deep dive into constructors. If I've missed anything or you have a nagging question, feel free to leave me comments or ping me on Twitter @JustrogDigiTec.